I know I’ve mentioned this before BUT I love recipes that only require a few ingredients, letting each component shine while they all pull together for one cohesive and delicious dish. 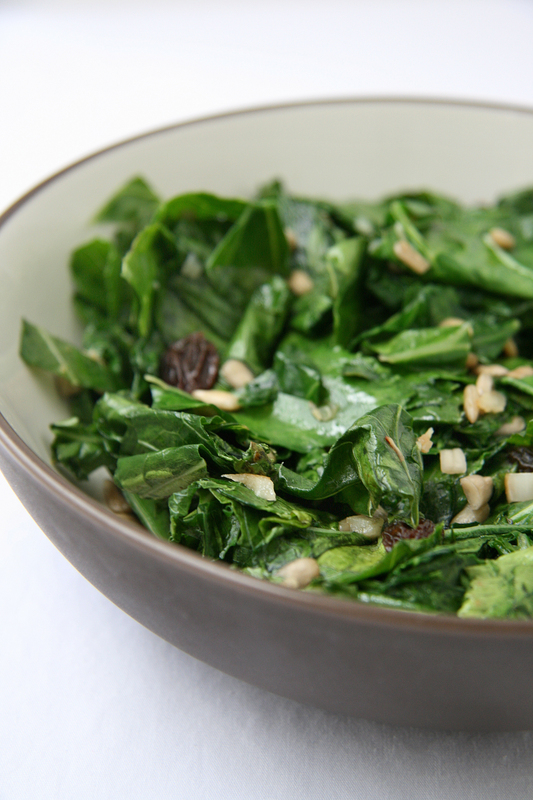 This simple but scrumptious recipe for sauteed collard greens is the perfect example of such. 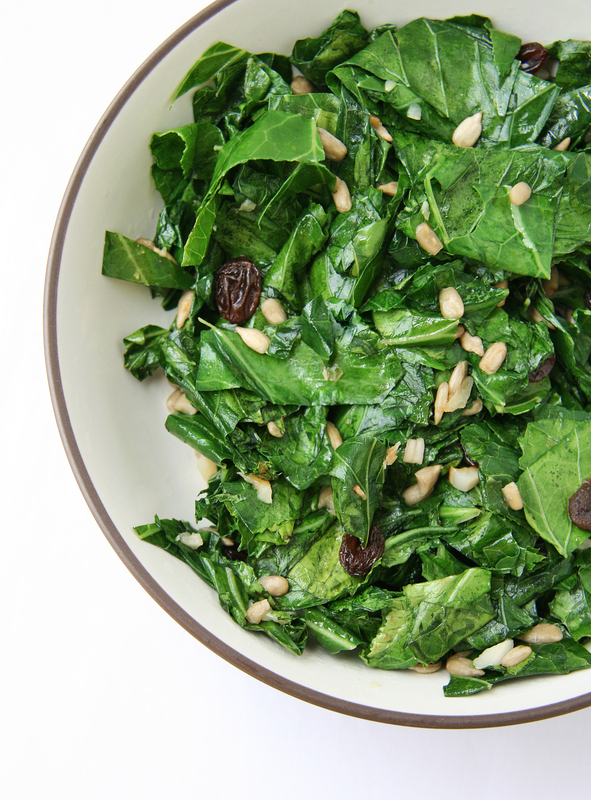 I might even go as far as saying that even those who aren’t fans of collards will enjoy these – the combination of raisins, greens, toasted sunflower seeds and garlic make for a lovely balance of sweet, salty and spicy…and not to mention incredibly healthy! Very low in calories (provide only 30 cal per 100 g) and contain no cholesterol. However, these greeny leaves contain very good amount of soluble and insoluble dietary fibre that helps control LDL cholesterol levels and also; offers protection against hemorrhoids, constipation as well as colon cancer diseases. Rich in invaluable sources of phyto-nutrients with potent anti-cancer properties, such as di-indolyl-methane (DIM) and sulforaphane that have proven benefits against prostate, breast, cervical, colon, ovarian cancers by virtue of their cancer cell growth inhibition and cytotoxic effects on cancer cells. An excellent source of folates, which are important in DNA synthesis and when given during peri-conception period can prevent neural tube defects in the baby. Rich in vitamin-C (provides about 59% of RDA per 100 g) which is a powerful natural anti-oxidant that offers protection against free radical injury and flu-like viral infections. An excellent source of vitamin-A (222% of RDA per 100 g) and flavonoid poly-phenolic anti-oxidants such as lutein, carotenes, zea-xanthin, crypto-xanthin etc. These compounds are scientifically found to have antioxidant properties. Vitamin A also required maintaining healthy mucus membranes and skin and is also essential for vision. An amazing source of vitamin-K, (provides staggering 426% of recommended daily levels per 100 leaves), which plays the potential role in the increase of bone mass by promoting osteotrophic activity in the bone. It also has beneficial effect in Alzheimer’s diseasepatients by limiting neuronal damage in their brain. Rich in many vital B-complex groups of minerals such as niacin (vitamin B-3), pantothenic acid (vitamin B-5), pyridoxine (vitamin B-6) and riboflavin. The leaves and stems are good in minerals like iron, calcium, copper, manganese, selenium and zinc. I was thumbing through the October 2007 edition of Everyday Food and was inspired by Martha Stewart’s Sauteed Collard Greens with Raisins. I didn’t have the slivered almonds or white-wine vinegar so I used what I had in pantry – I cut the dish in half, used sunflower seeds for the almonds, subbed balsamic vinegar and added sea salt, crushed red pepper and garlic for more flavor and a little heat. While searching for Martha’s electronic version of the recipe online for my post, I actually ran across a very similar variation for collards – Alicia Silverstone’s Sicilian Collard Greens with Pine Nuts and Raisins – no wonder the flavor combo worked well! 1. Heat a small skillet over medium heat. Add sunflower seeds and toast over dry heat for 2-3 minutes, stirring constantly, or until toasted to your liking. Remove from heat, transfer to a bowl or plate and set aside. 2. Chop the leaves of the collard greens into large pieces (I cut them to about the size of spinach leaves) then wash the greens in a colander and set aside to let drain (it’s good to have the leaves slightly damp). 3. In a large skillet, heat oil over medium-high. Add garlic and cook for 1 minute. Add collard greens and raisins; cook, tossing occasionally, until collards are almost tender, about 5 minutes. Add crushed red pepper, balsamic vinegar and sunflower seeds then stir to combine and cook for one more minute or until greens are cooked to your liking (I like a bite to mine). Remove from heat, season with sea salt if needed and serve! I’ve been looking for new ways to serve collard greens at dinnertime and can’t wait to try this recipe! Thanks! This looks wonderfully iron rich. Pingback: Fifty is the New Fifty - Have a Healthy New Year! Pingback: Fifty is the New Fifty | Eating and Drinking to a Healthy New Year!